Cast: Jay Hayden, Andy Stahl, Tori White, Scott Lilly, Kathryn Todd Norman and McKenna Jones. State of Emergency is a zombie styled horror feature from director Turner Clay. Yet, this films blends genres. 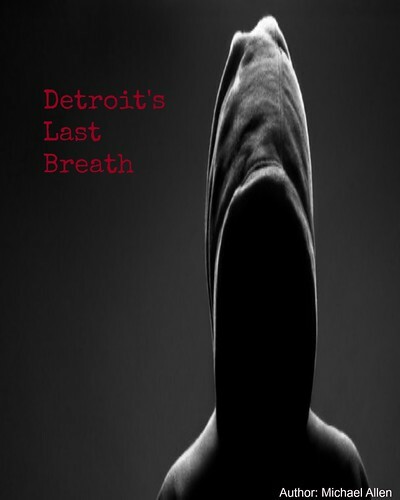 There is drama, action and even romance in this ninety minute thriller. Released in the United Kingdom in December, State of Emergency is an effective film, with Clay's narrative style creating for a compelling experience. State of Emergency is a film that should not be missed by zombie cinema fans. The film's story focuses primarily on Jim (Jay Hayden). Jim is caught up in a chemical explosion that takes place in Montgomery County. The chemicals from the plant infect Jim's neighbours and soon, he is on the run from those infected by a dangerous nerve agent. Jim makes some friends along the way. Emilie (McKenna Jones), Scott (Scott Lilly) and Alex (Tori White) each take their turn on camera and all four survivors hole up in a large warehouse. The infected increase in numbers just outside the warehouse doors. 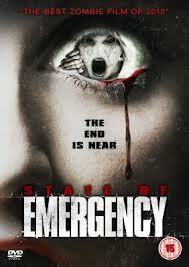 There are a few elements that make State of Emergency a zombie film. First, the infected have red irises. Some can speak, but those contaminated consistently have a red hue about their eyes. Second, those who are infected seek out and target those who are immune. Jim and his friends are consistently the target of zombie attacks. While the infected are not dead, they have very little awareness and they seem focused on feeding on others. This film fan sees State of Emergency as a zombie film, despite Clay playing with some of the genre conventions. Clay uses the zombies to create a diverse atmosphere. There are many genres housed in this small indie feature. The lighting of an almost empty barn amplifies some of the horror onscreen. The shadows play with the vision, until one of the infected attacks. As well, there is a good deal of action in this piece. Jim is constantly leading the attack against those that are plague ridden. Much of the action involves gunfire. Through flashbacks, the character Jim is developed through his relationship with Emily, his girlfriend. Their history is explored through slower moments in the film and a romantic element develops. These flashbacks also ad some complexity to the protagonist. Also, there is even some drama as the main character reaches out to the very damaged Alex. They find friendship in the most surreal of circumstances. All of these genres work together to create a fairly evocative film. And, Clay's narrative style keeps the story interesting. Much of the film is told out of sequence. The first scene in the feature is one of the last. The flashbacks, told from the perspective of two characters (Scott and Jim), add context to the film's events. Clay also keeps the shooting landscape simple, so that tension can be built through sound. Sound often foreshadows a future conflict. Clay's directing and plot choices are one of the film's strongest film elements. State of Emergency is a film for zombie fans. Although the action is sparse in sections, this title creates suspense based on what could happen to the characters. The film is unpredictable, at times. Often thrilling, State of Emergency is a film that will satisfy most horror fans, who enjoy a solid apocalyptic set tale. This is a film not to be missed. Overall: 8.25 out of 10 (characters are developed, the story utilizes many genres, there are unpredictable parts, solid script writing). *released in the United Kingdom December 24th, 2012.